Along with neatest design, this responsive Magento theme is equipped with various advanced features such as: Mega Menu with multiple columns, attractive slideshow with many smooth effects, ajax cart, ajax layer navigation, login with popup window, quick view product, brands slider, product hover effect, and much more. If you are own a fashion store or another type of store, you definitely can't miss this theme in your collection. This theme comes with 5 Preset Color Styles: Tomato, Orange, Cyan, Boocdo and Blue. Besides, it gives you the full control in customizing color schemes in back-end. You can also totally change your color for all params: body, header, footer... by using c-Panel. 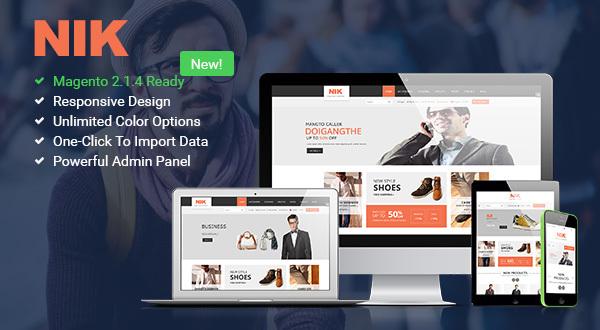 Nik is designed to be fully responsive layout, it will make your site have amazing look on different screen resolutions such as: mobile, iPhone, iPad and other tablets. This is one of the best option to reach the customers who use smart devices. With our mega menu, yoou can create menu with up to 6 columns to display categories and products with description, price, image, video, effects... or even add links to any page, static blocks with promotion banners and modules. Allowing you to Enable/Disable to display second product image when mouse hover effect. This feature is really useful with the stores that are in need of showing 2 sides of product right on homepage or listing page. You can easily and quickly create your eye-catching blocks with our static blocks. You can free to custom your own Static Block with images, links, videos, or other modules inside... that all depends on your wishes. Nik offers users 6 different types of product profile to choose from. You can select an appropriate one for different products to sell the products.